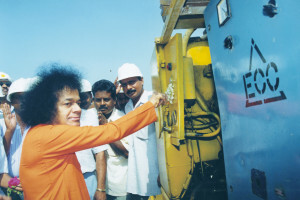 Hospital has its genesis in May 1999, when the government of Karnataka requested Bhagawan Sathya Sai Baba to accept a grant of a 52.24 acre plot of land in the EPIP area of Whitefield and to bless people of Karnataka with a temple of healing for the sake of poor and needy. That moment started the unfolding of yet another saga of Divine love and compassion. When the Divine wills, normal human limitations and norms do not apply to its execution. The speed and mode go beyond credible limits, and the presence of the Divine is made evident at every stage. All government procedures for handing over the possession of the land to the trust, approval of the plans, etc., were completed in record time. 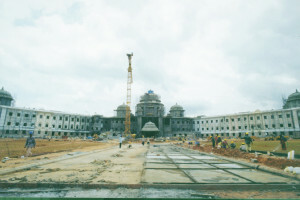 On 2 September 1999, the formal Bhumi Puja (ceremony for consecrating the land before beginning construction) and the laying of the north-east corner foundation stone were carried out. In a project of such magnitude, the various stages of concept, architectural, and functional designs and drawing, structural specifications with their designs and drawings, project estimates, tendering and contracting, mobilization, and commencement of execution are done in sequence. But here, all these activities were telescoped, and many of them were carried out in parallel. This was possible by the divinely inspired spirit of cooperation among the consultants, contractors, and suppliers, who treated the project as a joint and truly united endeavor. This was a lesson in unity in diversity to all those involved in the project. It was this sense of unity, inspired by the Divine Master, that made it possible to complete this mammoth project involving 6 million man hours within a span of 9 months. 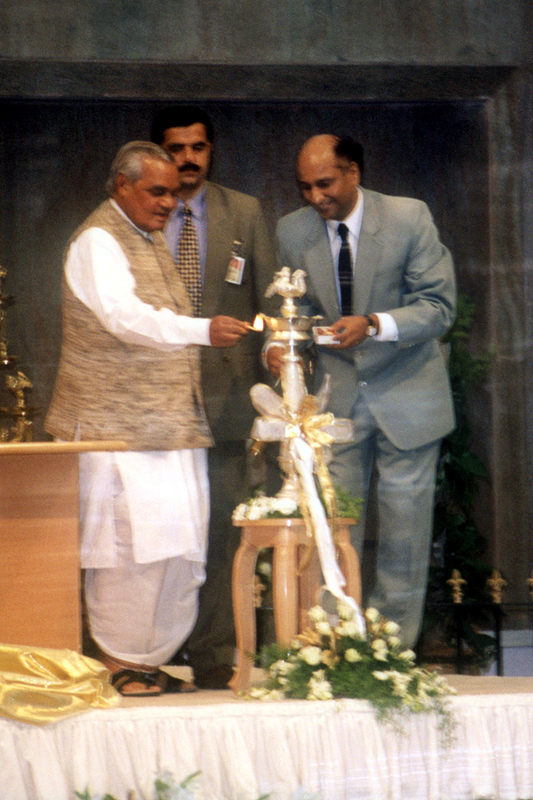 The Hospital was inaugurated on 19 January 2001 by the Honorable Prime Minister of India, Sri Atal Behari Vajpyee, in the Divine Presence. The Chief Ministers of Karnataka, Andhra Pradesh, and Maharashtra attended the function. After passing out with an Engineering degree in 1953, I worked for the Indian Railways, the Ghana Railways, and the World Bank, before I retired and was extremely fortunate to get the opportunity to work for Swami from 1997. I considered my self thrice blessed when I was given the role of Project Engineer for Swami’s Bengaluru Hospital Project in 1999. I also had the good fortune to work with Shri Rajan Sood, Shri Ravi Shankar, Architects, and Shri Srivat-san, Hospital Design Expert, as well as with a wonderful team of Accountants, Engineers and others. Some of them are still working as busily as ever in the Hospital. Dr. Hegde, who later became the Director of the Hospital, gave us invaluable advice during its construction. The cooperation and advice from L & T, headed by Shri A. Ramakrishna, was invaluable. 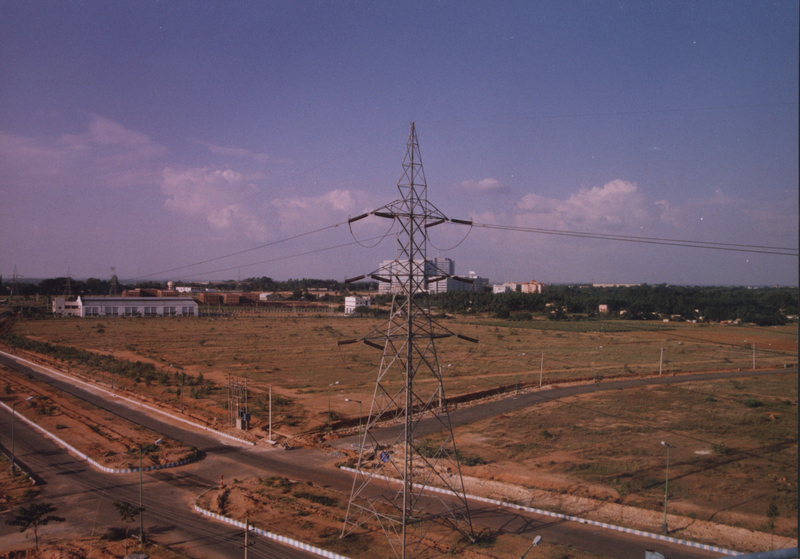 The leadership of Shri C. Sreenivas, who spearheaded the project and followed it up, played a major part in its successful execution. When preparing the Project Report for the Hospital, I realized that it was not going to be a place where the benefit of the treatment would go to the patients only, and where the benefits could be measured with the WHO unit of DALYs (Disability Adjusted Life Years). Since the Hospital was going to provide totally free succour to all, including the poorest of the poor, who would otherwise leave their families destitute, it was going to provide major resultant benefits to society, and also be an instrument of societal transformation. The societal benefit was not confined to the patients alone; their families and progeny would not only be saved from distress, but they would also be prevented from possibly going to the streets and causing crime, with major costs to society. • the front set-back from the road should be at least 200 ft.
• the hospital should neither look, or smell, like a hospital. During the construction of the Hospital, many very unique features were observed, which could occur only with Divine Grace. Contractors and suppliers were falling over each other in trying to fulfil their obligations. Bidders wanted to provide their inputs at the least possible price, as they wanted to have the satisfaction of having participated in a Divine Mission. Members of the construction team coordinated their activities and cooperated with each other in an exemplary fashion without any ego-barriers. When there was a state-wide sand strike, the sand truckers continued sand supplies, sometimes by night. Everyone involved knew that it was a Divine work, which needed nothing less than their best efforts. There was no industrial accident at all during the whole project period. When one supplier, selected by tender, could not get the imported item in time at a critical stage of construction, the higher bidder who had offered an item of a higher standard, gave the supplies from his stock at the lower price. Our team always remembered Swami, and after lunch every day, which we had seated together, one of us, by rotation would read out a piece of valuable advice from “Sathya Sai Speaks”. Among many other valuable pieces of Divine Advice, Swami specified the height of the top of the dome from the ground level to be 108 ft. He also specified the diameter of the rotunda to be 75 ft. 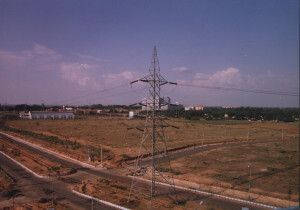 The overhead water tank was previously located at the south-west corner of the site. Swami wished that it should be shifted to the side of the building on the southern side, as, in the earlier location, the tank structure hid the view of part of the building from the main road, when approaching from the South. Swami took a keen interest in the assembly, on site, of the elements of the large chandelier in the dome. Swami also visited some of the staff quarters in the stage of construction. Every visit of Swami to the construction site was an eagerly awaited event. We would wait for the phone call from Brindavan Ashram, saying Swami is leaving. Swami used to come once in four or five days, whenever He was in Brindavan. Every visit, every moment was treasured by all. I was blessed to drive Him round the various important areas three times in a golf cart, with Him sitting next to me. Every moment, every second was precious. And, He gave me the most treasured minutes in my life, when, during one of his rounds (May 23, 2000), He created a gold chain and put it round my neck. Swami always brought sweets and goodies in a vehicle that followed His car, and we would enjoy them after the Divine Visit. the plant. The entry against the item “Quantity of effluent from the site” in the form to be filled in for the Pollution Control Department was: “zero”. When the day for the inauguration was coming nearer, Swami made it clear that He did not want an empty hospital to be formally opened – He wished that there should be some post-surgical patients in the wards on the day of inauguration. Needless to say, His wish came true! Whenever I see the Hospital now, I think of the lakhs of people it has saved from disaster. When I hear of the societal transformation taking place in the localities where the treated patients live, I am convinced that it is a Temple of God radiating Divine Blessings, and not a mere Hospital – and my feelings of gratitude to Swami for giving me a miniscule part in His Mission overwhelm me. How can I ever thank you, dear Bhagavan? Shri Rajan Sood, an Architect by profession, was chosen by Bhagawan Sri Sathya Sai Baba in 1999 and guided him to design the Sri Sathya Sai Institute of Higher Medical Sciences. In an interview, he shares his experiences from the time. Q: Can you please share how you came to Swami? Rajan Sood: I am an architect, basically born, brought up, and educated in Delhi. I saw Swami for the first time in 1972 when he came to Delhi. He spoke to me for the first time in ‘73. In the 70s, there used to be Summer Course for college students pan India and all over the world. In ’73, I enrolled in the Seva Dal. I had some very beautiful experiences then. In ’74, I applied and was allowed to attend the Summer Course in Brindavan for a month. That’s where things really started between Swami and me. And, thereafter, for every Summer Course held in Brindavan, Swami allowed me to attend all of them, till almost the mid 90s. That is where the serious interaction started and continued. So before the hospital project came by, I had physically been with Swami for 25 years. Q: Did you do any projects for Bhagawan before the Hospital project come by? RS: The first project happened way back in ’77-78 a girls’ school was to be built in Delhi. They asked me to design that. I designed it and the school drawings Swami had approved himself before construction. In ’81 or ’82 Swami laid the foundation stone for that. Thereafter, the Delhi-UP Trust wanted to build a boys’ school in Rishikesh. I was approached to do that project and of course, I had started. While I was doing the Rishikesh project, on one occasion that I was going to go to Puttaparthi, I thought I would carry all the drawings with me and show them to Swami. Swami called me in and I think this was in 1999, and he was looking at the drawings and he started talking about the Bangalore hospital. “Bangalore mein hospital banaata hai”. I thought it was just a bit of information he was giving me. “Dekho idhar Puttaparthi mein banaaya … Puttaparthi village hai.” Most of my conversations with Swami were either in Hindi or in English or a mix of the two. So then he said, “Abhi Bangalore mein banaata hai. City hai. So, grand hospital banaata hai.” I said, “Yes, Swami.” Then he put the drawings of Rishikesh project aside and started to talk about what all would happen in that hospital like cardiac surgeries and so on and so forth. He spoke about quite a bit and at that time, only my wife and I were sitting at his feet. There was nobody else was in the room. He started explaining further, “Dekho, Bangalore kitna bada city hai. Bahut bada hospital banata hai. Usko look do Buckingham Palace jaisa.” These were his words. I was pretty foxed but obviously came back to Delhi, started preparing designs, and they were quite elaborate. In my next visit to Swami, which was under a month from this interaction, I carried those drawings with me. Q: Did he give any other specific instructions during that interview? He took me behind his room. I think this was the backstage of the auditorium and that place was full of models of the Bangalore hospital. I don’t even know how many there were! The very look stunned me. They were made by some of the finest internationally known architects. They were all lying there, designs made by them in three-dimensions. Swami’s purpose of taking me in was to show me what people had done. Not probably the quality of work but the number of people who would have given anything to do that project. And then he said something very beautiful to me. And that was, “Dekho, Kitna architect design banaake bheja. But I chose you.” He had his own way of overwhelming you with his words, his love, his affection. Q: And how did the designs begin to take shape? RS: Since I was based in Delhi, it was not possible for me to be in Bangalore all through. So, the basic plan, designed by an architect in Bangalore, in consultation with the doctors, medical planners etc. was sent to me in two-dimension. The elevations, they are so elaborate, and making a drawing of everything was taking a lot of time. First, to design and then, to detail everything. I think the very next day the gentleman called and said, “Swami is asking for you. Please come with the designs.” And much to my surprise, within that day, it transpired – we didn’t work overtime, we did nothing – all the drawings were ready! And I packed and the very next day I left for Bangalore. So we had a long discussion. All the drawings were there. The Chairman and his team looked through all of that. Then we got a call after about an hour that Swami is calling us. We went into Trayee and Swami sat down in his chair in the small living room and he looked at each drawing. There was a huge number of drawings and he looked through all of them. Q: Were they basically the elevations or the interiors also? Well, then the work started and went on full swing. I would spend 15 days in Whitefield, and 15 days in Delhi getting things ready and for every visit monitor the progress and review. I would click the pictures of the hospital and of course, all further drawings that were made, I would take them to Swami. That year, I must have met at least 12 or 15 times because every month I was there and the moment he would see me, he would call me in and start looking at all drawings and every photograph, ask questions of how this is going, how that is going. He monitored everything very, very minutely. Every thing. Every aspect of it. And towards the end, I think, last one or two days to the opening, and somebody walked up to me and there is the gold kalash that has to go on top of the dome, tell us how to do it. I said I haven’t the faintest idea and I think it is too late in the day to do it. And on the day of the opening, when I was approaching the hospital, I saw the kalash was already up. So he had, he has his way of making things work. He doesn’t need us. My understanding is that we were used just to make us feel part of his team to receive his love. Everyone has been given something that Swami could use in his missions, not because that person is special but may be that becomes the way of Swami’s conveying love to you. There is no other reason. Every time he would wait and ask, “What have you brought? What is the new thing they are going to do? What are the additions we are doing? What is the development that we made?” This is including the photograph in the mandir. Up, at a higher level, there is a photograph. For this photograph, I didn’t know what to choose. Somebody directed me to a devotee who was into printing on flex. I went to his factory, and we chose some photographs. I had four or five of them done up the same size and next morning I took them to Swami. And, “Kya hai?” I said,“Swami, mandir ke liye photographs hain.” “Dikhao.” The road in front of Trayee…we opened up the photographs there and he chose, “This one. This is the one I want there.” To that little extent, he was involved. It was him initially, and him taking care of everything till the end. If I were to do a project like this, I think 5 to 6 years is the minimum time, for a project like this to come up with this kind of intricacies. Plain simple buildings are very easy to do. But when you are wanting to match the level of Buckingham palace, it is a very tall order. Very, very tall order. Q: How come the colours of the hospital are different from Swami’s other buildings? R: The original presentation that I had made to Swami was in these colours. During the course of the painting work, we did try out a lot of options, permutations and combinations of blues, pinks, yellows, off-whites. It wasn’t working out right. Then one fine day the other architect said why don’t we go back to the original? We did and it looked very beautiful. That is when it was decided that we would stick to the original colours. S: And did you actually see the Buckingham Palace in person? R: (laughs) Later. These days we don’t have to see, you just log on to the web and you got the world there. I don’t think Swami meant that we should replicate the Buckingham Palace. What he was trying to convey was something as grand as the Palace. Because if you see the two buildings, they have nothing in common. They have absolutely nothing in common. Our hospital in terms of its detailing, the concept – it’s very, very Indian. It’s more like a very grand Indian palace. It could not be anywhere else. When you look at the details – the columns, the brackets, the domes, the gopurams on the parapet, all of that is very, very Indian. There is nothing of Britain in that. So as I understood it what he meant was that it had to be grand like the Buckingham Palace. Other than that there is nothing, there is nothing at all that looks like the Buckingham Palace. I think our hospital is more intricate than Buckingham Palace is. Incidentally, the stained glass was purely my idea. The flowers and the decorations had nothing to do with any kind of medical properties or medicinal things. We just wanted to make it look grand. That was just the intention to add some interesting elements to the dome. Q: Was there a plan to have a waterfall in the dome area? R: There was a waterfall planned, originally on either side of Swami’s picture. At some point of time it was felt it would be tough maintaining it and it was modified. Q: What about the chandelier? R: My only contribution to the chandelier was the size. I was asked what should be the ideal size to fit into a dome of this size. So I just gave the dimensions and one fine day, when the dome was finished I found a whole lot of Italians walking in with crates and crates of components for the chandelier and they started assembling. That was my first look at the chandelier. Somebody did show me some images earlier but the sheer size of it you get to understand only when you see it. Q: Would you rate this as one of the best projects that you have done? R: Yes, undoubtedly. For many reasons. But mainly because this was created with Swami. Question: Can you please share your background and how you came to Swami? started designing office complexes, industrial buildings and commercial buildings. I was studying in Chikballapur, and had my first darshan of Swami as a nine-year old boy. As I grew up, I found being drawn to Him and became a devotee. In 1992, I had a chance to design the present book stall building at Brindavanam. Swami inaugurated the building on 14-Apr-92, and it happened to be my birthday. For the first time, I had a chance to have blessings of Swami and from that day, His blessings started showering on me. It was an unforgettable day in my life. and the Sri Sathya Sai Mirpuri College of Music. Question: How did your interest in hospital design come about? RS: While I was primarily into designing office spaces and industrial complexes, I also got opportunities to design small nursing homes in and around Bengaluru and it was during this time that my interest in hospital design started. It was a fascinating area of expertise, and it was during this period that I got to know closely the needs of the doctors, patients and the requirements of various clinical specialities. In early 1999, Bhagawan announced His plan to build the super-speciality hospital in Bengaluru, and I was eagerly looking forward to the opportunity to design the hospital, though it seemed very ambitious. Question: And how did Swami make it happen? RS: When the Chief Minister of Karnataka, JH Patel, came to Puttaparthi to offer to Swami a large piece of land to Baba for constructing a super-speciality hospital, I was fortunate to be a witness to this event. Shortly thereafter, I was present at Bengaluru, along with a cabinet minister. Swami called us both in for an interview and He presented me a navarathna ring and told me I will be very busy after August. I could not grasp the import of Bhagawan’s words at the time. It was around June-July, that my prayers were answered and I was instructed to present a design of the hospital. My joy knew no bounds, and I set off the designing the hospital in earnest. Question: And how did the actual hospital design take shape? RS: Since I had no prior experience of designing large hospitals, I visited various hospitals in Bengaluru to understand the clinical requirements. Also, there were Bhagawan’s guidelines that the building should not look like a hospital, but like a temple of healing. His other inputs were for it to be grand, have sufficient light and ventilation. This was how the K-shaped structure came about. The ceilings were all made 14-feet high, as opposed to the conventional 9-12 feet, to give the building a grand look. As the design progressed, we wanted to prepare a model to show Bhagawan, so it will give Him a clear picture of the character and style of the building. Within three weeks’ time, the model was ready. When we took it to Parthi for Bhagwan’s inspection, Bhagawan saw it, and said, “You have designed the building just like the Buckingham palace, which was in my mind,” and presented vibuthi and blessed me. Though I made the design, I cannot take credit for the design, as it was purely Bhagawan’s inspiration and blessings. At Swami’s behest, I was asked to explain the key components of the design to a team of doctors, which was apparently satisfied with the design. At this moment, I felt I have achieved a significant goal in life, but I still kept my fingers crossed that I will be given the opportunity to work on this project. I must share here that during this period, I had only five members on my team, and all of us used to work 18-20 hours daily for a period of three weeks. In spite of such a hectic schedule, we never felt tired or stressed in our minds and body. This can happen only with Bhagawan’s blessings. Finally, to my joy and efforts of my team, we were awarded the contract of designing the hospital. We were to work along with Shri Rajan Sood from Delhi, the work allocation being we were to design the basic framework and provide for the various services within the framework and Shri Rajan’s scope was to design the facade of the hospital. We worked very closely with each other on this project. Question: Could you share how the hospital colors are muted, and different from other Swami’s buildings? RS: During the construction stage, we had numerous visits to Parthi to update Bhagawan on the progress. During one such visits, Bhagawan granted me an interview, during which I informed Him that we would be trying out different colour schemes and make samples on parts of the buildings and that we would need His approval. Bhagawan graciously consented and informed that He would see the building when He next visits Bengaluru. Within a week, Swami came to the site, saw the color and approved the present color scheme. Question: What, in your opinion, was the critical factor for such a short project execution period of 16 months? RS: The critical factor is solely Swami’s blessings and the shakthi Swami gave the project team and of course to L&T, whose micro planning was commendable and we were able to adhere to all timelines. Also, I recall how, in an interview to the project team, Swami taught us the importance of teamwork, using the example of a garland. He explained how a garland looks very fresh and beautiful on the first day, and how the next day it fades to 75% of its beauty and on the third day the flowers will dry and fade. But, He mentioned, the thread holding the flowers together, continues to be strong. He emphasized teamwork and said that all the individuals should hold their hands together and work together and be like the thread in the garland. We had a very good project team, headed by the project coordinator Shri Satish Nayak, Mr. Srivathsan, who helped us with the critical area of medical planning, the L&T Director, Shri A. Ramakrishna. They were all highly competent individuals, and more than that, very devoted to Bhagawan. Of course, there were many other individuals, both named and unnamed, who selflessly worked for the project, inspired by Bhagawan’s ideal. 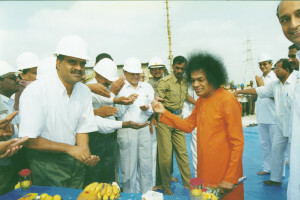 Without Bhagawan’s blessings, it would have been humanly impossible to accomplish the task of building such a huge structure within such a short time-frame. “The Hospital project was a very unique opportunity for me. Having been involved in the design of many corporate hospitals, the SSSIHMS hospital project was a paradigm shift, where the patient and the patient needs came first. “Since they were no agreed-to standards in those days, we followed the US standards in many cases, and in certain cases, we evolved our own. These standards, keeping Swami’s guideline of ‘Patient First’ in mind, surpassed some of the US standards too! The sterile areas were provided with 100% fresh air, which ensure higher air quality, and faster patient recovery. Given that such a feature would mean higher capital & running costs, even reputed corporate hospitals would give such decisions a second thought. The space requirements for individual specialities too, are more than adequately fulfilled. There was no expense spared by Swami to ensure the best quality care delivery to the patients,” he says. T he glass chandelier, in the foyer of the Hospital, is a work of art from Murano, Italy, an island in the Venetian lagoon, where glass has been made for over 700 years. The journey of the chandelier from Murano to SSSIHMS, Whitefield is a fascinating one. The Daswani family has been devoted to Swami for many decades. When they heard about the Whitefield Hospital coming up, Mrs. Shakuntala Daswani sought Swami’s permission to donate a chandelier for the central dome of the hospital. Swami not only blessed her with the opportunity, but also indicated the colors of the chandelier. While looking for a factory, which could make large chandeliers, they were guided to Andromeda S.r.l., which had, in 1991, supplied the chandelier, adorning the central dome in the Puttaparthi superspeciality hospital. Andromeda S.r.l. offered a special price for the chandelier, and once on the job, almost 30 people at the Andromeda factory worked continuously for 3 months to create the chandelier, made up of 11,000 individual pieces of glass, all blown entirely by mouth. The model of the chandelier is Ca rezzonico (named after a palace located on the Grand Canal in Venice) and the colour shade is ‘Clear & Ruby’. The height of the chandelier is 12 m (36 feet) and its diameter 7.2 m (22 feet). The gross weight of the chandelier is about 2 tons, and it has a total of 486 bulbs of 60 watts each. The chandelier arrived by air in Bengaluru in a 40’ container. Five engineers from the Andromeda factory worked round the clock and installed the chandelier in five days. The chandelier embodies Swami’s principle that at His Institutions, nothing but the best is given to all who enter its gates. And at the time of writing this article, not one of the 486 bulbs had to be replaced in the last 14 years!